Our clients can avail from us a comprehensive range of Industrial Components that are high in demand with our clients worldwide for their high performance and durability. 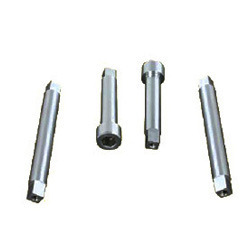 Fabricated using superior quality raw material, these Industrial Components like industrial spindles, striker nuts etc., can be customized according to the individual requirements of our clients. Owing to our vast experience and expertise in this domain, we are engrossed in providing our customers with Precision Spindle. We offer our clients an extensive gamut of industrial spindles that are used for different grinding operations like thread, internal surface, tool, flute, cutter and others. Fabricated using premium quality raw material, these spindles are high on durability and efficiency. Our range of dynamically balanced industrial spindles can be assembled with special grease and undergo rigorous Run-Test to check their optimum performance. • For calibrations that retain heavy duty and quality for high precision grinding operations.